Speculation has been running wild recently as Smackdown General Manager, Daniel Bryan, has inserted himself in the Sami Zayn & Kevin Owens vs. Randy Orton & Shinsuke Nakamura tag-team match at this Sunday night's pay-per-view, Clash of Champions. He won't be the only one wearing the black and white stripes, however, as his fellow Special Guest Referee is his boss, the Smackdown Commissioner, Shane McMahon. Many rumours are flying around, stipulating that Daniel Bryan could be at the heart of not only the 'Yes Movement', but also the 'Yep Movement', introduced last Tuesday night by Owens and Zayn. Could Daniel Bryan be turning on his boss by helping Owens and Zayn in this match? Anything could happen in a Special Guest Referee match. Yes, we've seen plenty over the years, with twists and turns along the way. So has Daniel Bryan, having been involved in several Special Guest Referee matches in the past. 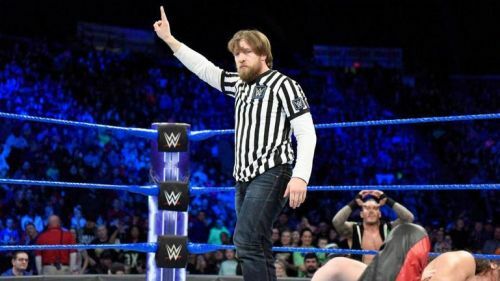 With him putting on the customary striped shirt, let's commemorate this moment by taking a look at the top 5 times Daniel Bryan has been involved in a Special Guest Referee contest. Daniel Bryan was not always one of the most popular WWE Superstars of all-time. During his first World Heavyweight Championship reign, after cashing in his Money in the Bank contract against his former buddy, Big Show, he made a transition into an arrogant heel character whilst mistreating his storyline partner, AJ Lee. Meanwhile, Sheamus won the 2012 Royal Rumble and therefore had his sights set on Daniel Bryan and challenged him for his World Heavyweight Championship at Wrestlemania 28. After 'The Celtic Warrior' defeated Bryan within 18 seconds at 'The Show of Shows', Bryan challenged Sheamus at Extreme Rules in order to regain the Championship. On the Monday night Raw before Extreme Rules, Sheamus would have a one-on-one singles match against Mark Henry, with the number one contender, Bryan, as the Special Guest Referee. This match concluded with Daniel Bryan screwing over Sheamus by fast-counting him and rewarding Henry with the win. This feud culminated at Extreme Rules 2012, as Sheamus successfully defended the World Heavyweight Championship against Bryan, who then went on to feud with CM Punk.